Turn that bbq back on, pop that bottle of chamgpagne you’ve been saving, and strike up a tune because it’s time to celebrate; the king has returned. 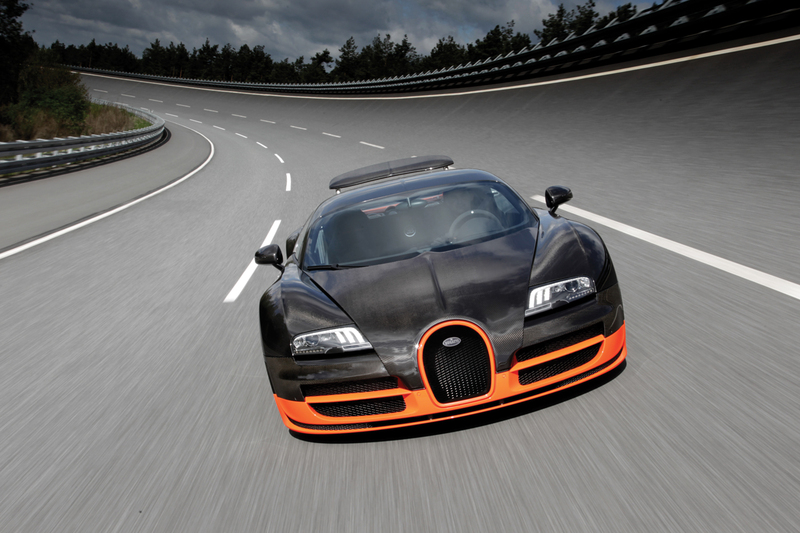 It’s official, the Bugatti Veyron is once again the fastest car in the world. 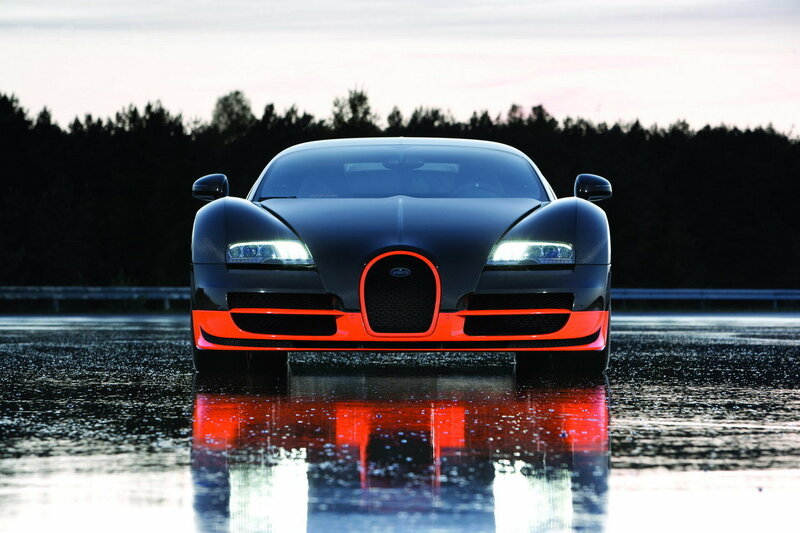 We should clarify, a Bugatti Veyron is the fastest car in the world. This isn’t your kid brother’s Veyron, it’s the all new 2011 Bugatti Veyron Super Sport, and never has a car more completely lived up to that name. At Volkswagen‘s Ehra-Lessian, the same track where James May forever erased his nickname “Captain Slow”, chief Bugatti Test Driver Pierre Henri Raphanel climbed into the fastest office on four wheels and headed out onto the 12 mile oval. Guinness World Record officials were present as the Super Sport headed out onto the course. To set an official record you have to do a run in each direction, and they take the average. You have one hour to complete it, and no one can touch the car. 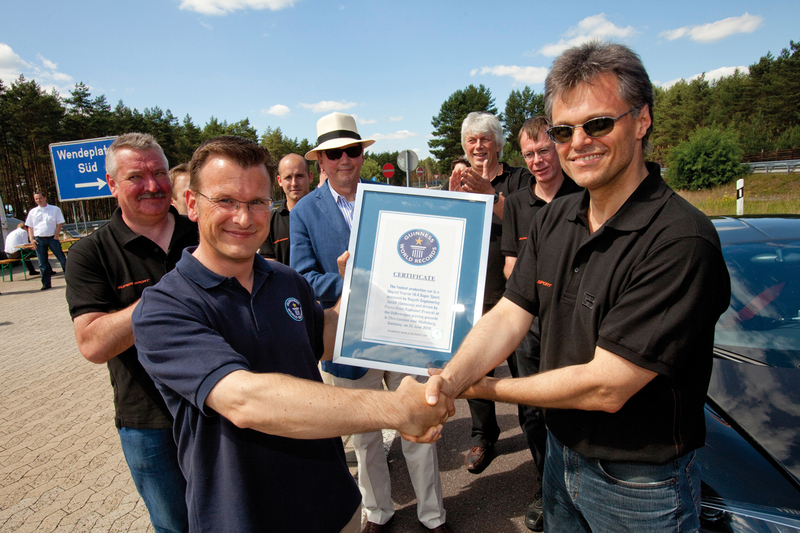 On the first pass the Veyron SS passed at 265.91MPH (427.933km/H). On the second pass that speed increased to 269.81 MPH(434.211km/H), for an official average of 267.86MPH (431.072km/H). The normal Veyron has a 16 cylinder engine that is fitted with 4 turbos, and makes 1,001hp, a figure immune to the word, “inadequate.” But when we hear “turbo” we think boost. And when an engine comes from a factory with any amount of boost, our brain immediately wonders what fun can be had with more boost. Bugatti says several of its Veyron customers had been wondering the same thing, so with the current production run coming to an end it seemed like an appropriate time to answer the question. This orange and black teleportation device before you is more than an over-priced boost controller. Bugatti improved on every piece of the Veyron, the common word being “bigger.” Bigger turbos and intercoolers, larger springs, thicker sway bars and enlarged front air intakes. The result of their engine-building encore is 1,200hp and 1,106lb ft. of torque. I don’t know if it’d be cheaper than dynamite, but they should use one of these the next time they need to demolish a bankrupt casino. The body is now 100% carbon fiber, reducing weight significantly. And thanks to its new flush-mounted air intakes on the roof, it’s more slippery too. Not only can it walk down any production car on the road, it has 1.4g of lateral grip to juke through corners as well. If the Veyron was a learjet, this is a MiG. Production for the 2011 Bugatti Veyron Super Sport will start in the fall, but it will make its first public debut in August at the Concours D’ Elegance in Pebble Beach, CA. The first 5 cars, dubbed “World Record Editions” will be done in the orange and black you see above. After that customers can get them however they like. You would expect that a car costing $2.4 million would give you that choice, but we doubt paint selection will be “on the house.” We’re just glad to see that the king is back, and isn’t going out on his laurels. Transtar Dagger GT: 2,000hp Veyron Slayer or Epic Vaporware? Why would they put “average” speed. The top speed is 269.81 not 267.86, were not rounding or averaging here, maximum top speed is 269.81mph. Only .68 seconds slower than the Venom GT and the car weighs twice as much.